Kissmetric is well suited for people that feel that they are not seeing the right kind of data from Google Analytics. If you have ever looked a Google Analytics report and said "I wish I knew what the 10 people that read this case study did before, after and even a week from now on my website", then Kissmetrics is for you and will help you answer those questions.On the other hand--if you have no technical expertise or knowledge of viewing data, then Kissmetrics may prove a bit difficult for you to set up and manage. The URL API, when combined with reports and people search, is very powerful. It allows you to create and track a virtually unlimited number of cohorts using property and event tracking. 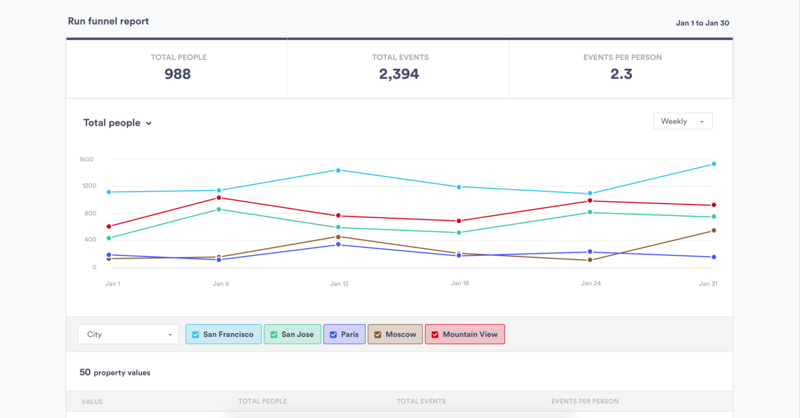 Live view is fantastic for a bird's eye view of what's going on with your users in real-time. We use this often to test our funnels and make sure things are indeed tracking, and that it's set up in a way that is actually helpful to us. Kissmetrics support is bar none– they're friendly and speak in terms that even the most novice of users can follow. Click-to-track makes it virtually fool-proof to specify events and actions to track, without having to figure out any complicated coding. High learning curve: it's not immediately straightforward how to implement for your specific use case. Reports are limited in number of fields you can include (although this has improved). Dashboard has a limited timeframe. Funnel analytics reporting is generally quite good. The drag-and-drop functionality is great and it's easy to use. I would rate this a 7 or so. The problem is the home page or dashboard. This consists of a bunch of boxes with numbers in them and is very weak on visual design. It's quite confusing to look at and doesn't give an instant visual picture as to what is happening. It seems as though this was not given very much thought by the team. The Google Analytics dashboard is very much stronger in terms of visual design. Everytime that I've needed or contacted support, I've received a quick response and timely help! There was even a major issue we had with connecting Unbounce into Kissmetrics. They brought in multiple people and worked with us for hours to make sure we could figure out the issue and get everything running! I have no complaints about the support team! I loved this aspect of the product. It wasn't just that the documentation and online tutorials are great - which they are - the on-boarding process though was really stellar. Once you have set everything up, you get a welcome message followed by a step-by-step guide to get you started that is built right into the product interface. For example, the UI asks you to first do X, and then copy this code snippet and send it to your developer who will know what to do with it. When you come back after the first interaction with the product, it continues the process by explaining right in the UI how to track events etc.This kind of step-by-step approach is incredibly efficient. Although there are various forms of supporting documentation (PDFs videos etc) to support every step, you don't really need them. This approach means that you are up and running very quickly with virtually no training time or documentation consultation. Highly efficient process.